In this June 24, 2015, file photo, pedestrians pass in front of a Whole Foods Market store. Nine managers who were fired by Whole Foods supermarkets for allegedly manipulating a bonus program filed a class-action lawsuit against the grocery chain. 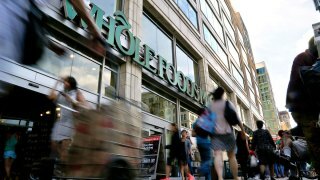 The lawsuit also accuses Whole Foods of defamation for telling media outlets that the managers were stealing bonuses from their workers at stores in the Mid-Atlantic region. Each of the plaintiffs is seeking $25 million in damages. “These allegations are not consistent with the findings to date of our internal investigations and we will respond appropriately,” Betsy Harden, a spokeswoman for Austin, Texas-based Whole Foods Market Inc., said in a statement. Another Whole Foods spokeswoman, Brooke Buchanan, said earlier this month that the nine had been dismissed in recent weeks after a company-wide investigation. The managers worked at stores in the District of Columbia, Maryland and Virginia. According to the company, they wrongly benefited from a profit-sharing program at the expense of store employees. The lawsuit, however, claims that it was company policy to use money from the bonus program to make up the difference when store departments went over budget. Buchanan said when announcing the firings that Whole Foods was still investigating exactly how much money is involved and planned to ensure that employees at the affected stores are compensated properly.